Why Hiring the Right Sitefinity Development Company Is Important? In this digital age, every single company wants to grow at an alarming rate and so they are creating business solutions using new platforms that can enhance their online presence. As a software development consultant, I have always observed that our clients are becoming more and more demanding and want effective business solutions that meet their specific objectives and goals. They want to remain a step ahead of the competition, get armed with strategies and plans that drive the bottom line impact by using personalization. Based on their needs, we suggest the best platform that can add value to their business. Since using a powerful CMS is everyone’s target, and those who are looking for extended functionalities, we suggest Sitefinity for their site. Telerik’s Sitefinity CMS is an open source framework based on Microsoft .NET technology. It offers huge advantages because of its innovative open-framework architecture, exclusive inbuilt features and functionalities, intuitive user interface and unlimited extensibility. But to use all these benefits, it is important to choose the right Sitefinity partner to work on your project. So here, I will discuss the importance of choosing the best Sitefinity development company for your business. 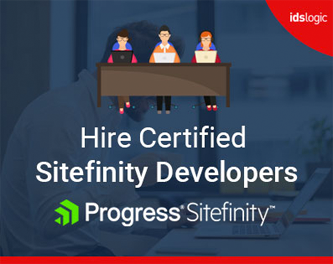 Technical expertise: Hiring experts in Sitefinity development means that your project will be in the hands of a team who are committed to this award winning platform and has the expertise to use this powerful CMS so that you get to create a website that is feature rich, offers great user experience and generates higher revenues. Custom modules: A reputed Sitefinity company will have immense knowledge of the Microsoft environment. Since Sitefinity is a native Microsoft .Net application that integrates fully with Visual Studio, it is possible to create custom modules, themes and controls right out of the Integrated Development Environment. And this can only be done by developers having great experience in multiple Sitefinity projects. Hiring them also helps you to meet your specific business requirements. Too small or big agency: Hiring too small an agency without comprehensive knowledge of best practices will only be a waste of time. Similarly, looking for very big companies for your project may not be a good idea as it might increase the costing of your project. So before choosing an agency, it is best to take a look at their portfolio page, which will give you an idea of their work, the type of projects that they have handled and it they are the right team for your business. Finally, it is a good idea to contact them and arrange a meeting with the company so that you can discuss your requirements with them and listen to the solutions that they have to offer.